Woo! I received my first Graze box! 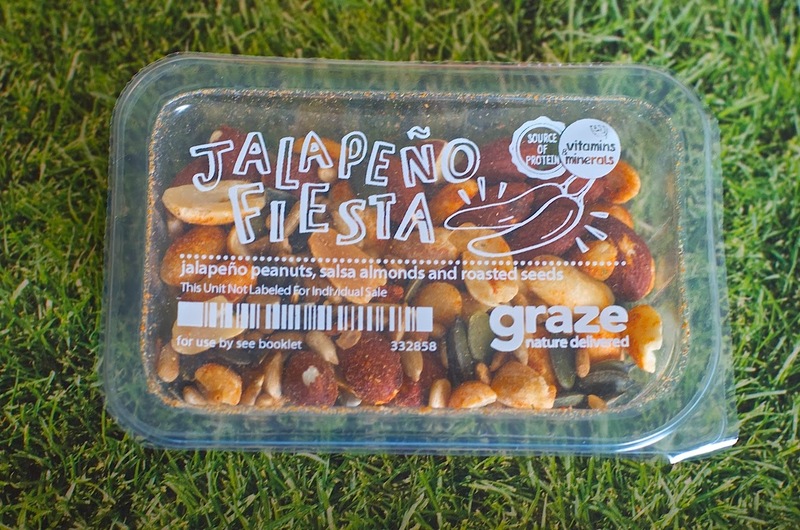 The folks at Graze have figured out how to elevate the generally mindless, uninspired afternoon snack to an art form. Seriously. Hyperbole, you say? Well, consider this. They offer a dizzying assortment of healthy, tasty, and super-creative snacks, from sour cream and onion cashews to dried berry assortments (including goji!) to baked soy bites and a sweet chili dipping sauce. You won't find pedestrian pretzel mixes or sad peanut pouches here. All the snack options are innovative and exciting, and perfectly portioned for a satisfying, reasonable snack. Possibly the coolest thing about this sub is just how customizable it is. You get to look through each of the snack combinations --all 90 of them!-- both before you receive your box and anytime after, so you can indicate for each whether you love it, like it, are willing to try it, or hate it and never want it sent to you. Based on your preferences, Graze picks out four snacks, packs them up, and sends them to you either every two or four weeks, depending on the schedule you prefer. And that's it! So user-friendly. 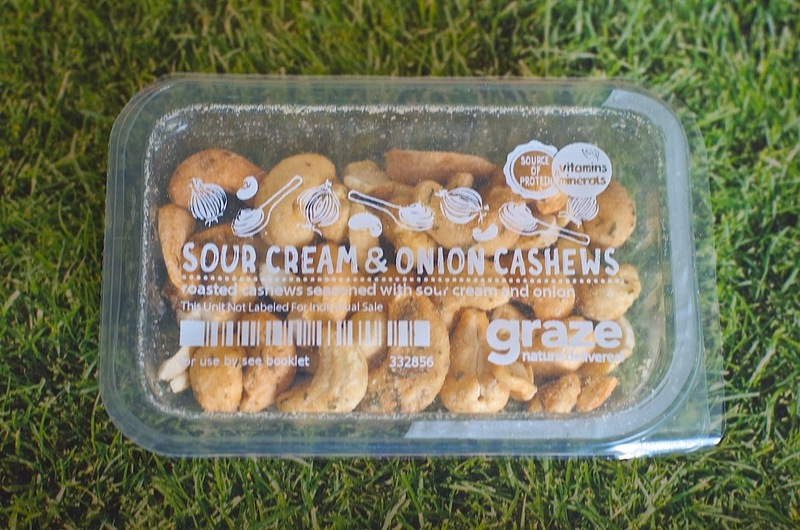 Also, you can feel extra good about subscribing to Graze because they source their products from small suppliers, which means you're supporting deserving small businesses and you're basically guaranteed food made with love and care. 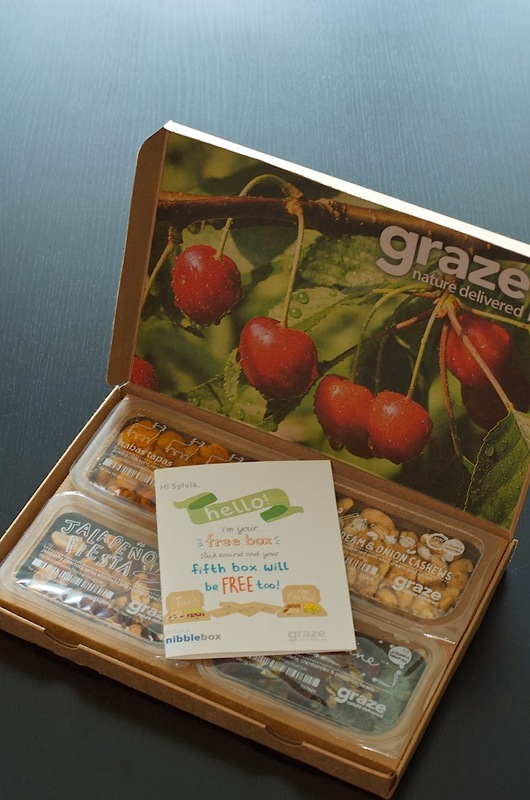 Not only are Graze's snacks and service awesome, but their boxes are gorgeously put together. 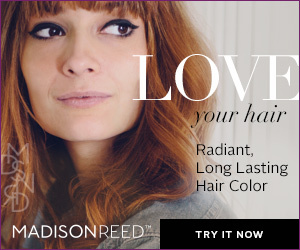 I mean, just look at this deceptively simple product design! Amazing how good a little cardboard box can look, right? Not only is it pretty (those cherries in the background photo! ), but also really ingeniously put together: you won't believe how slim the box is, and how much fits into each of those four little compartments at the same time. This was such a cool first look. 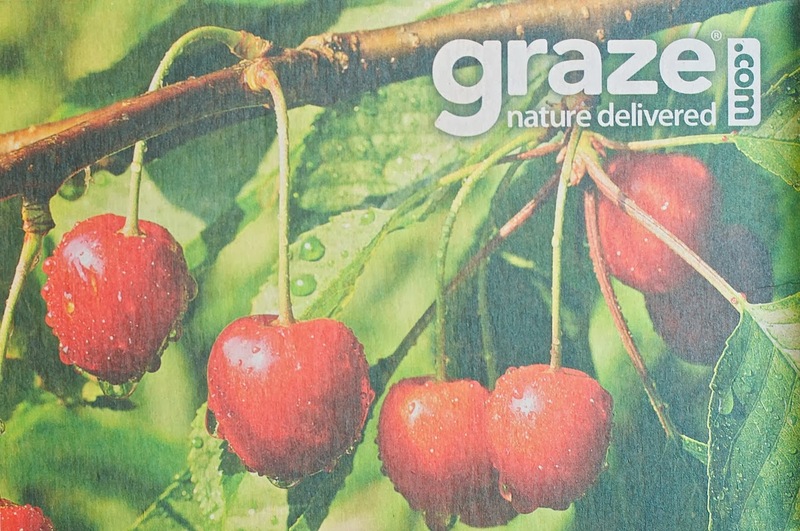 The booklet welcomes you to Graze, gives you nutritional information about the enclosed snacks, and lists a unique code you can share with friends (or, ahem, with blog readers) so they can sign up for their own subscriptions. On to the snacks. I enlisted my boyfriend's help to test them out over a couple of days because, you know, tasting yummy foods is haaard work. The seasoning on these was so good: rich, sour-cream-and-oniony, but not overpowering. So smart to flip a flavor usually associated with guilty-pleasure chips and pair it with healthy cashews. These are firmly in my "like" corner (and they'd probably be in my guy's loves, since he ate most of them). These were amazing, like the most delicious, plump corn nuts ever! They were so addictive, we ate them in one sitting -- and probably risked cracking some teeth in the process! They're just as hard as they are good, so much to my dismay, I had to relegate them to the "trash" corner. If you have strong, healthy teeth though, don't pass these up for anything! Only slightly spicy, well-seasoned, and varied enough that we wanted to keep eating. Really good and satisfying. 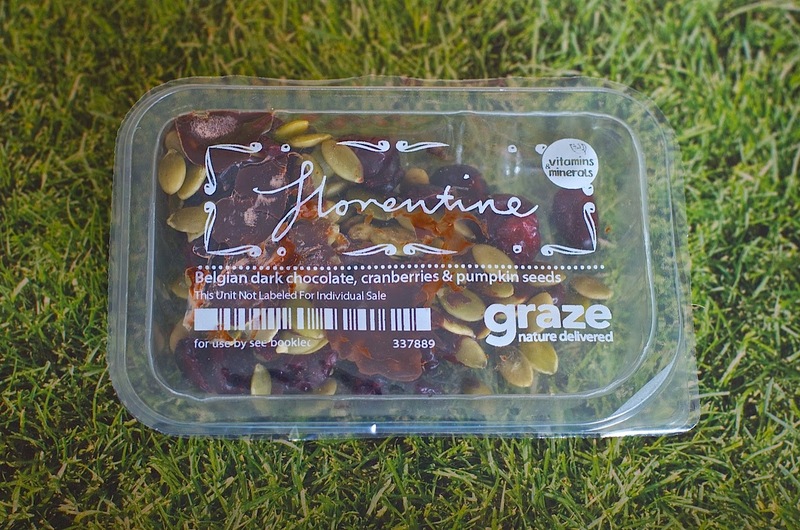 Sadly, the dark chocolate pastilles melted in transport and sort of glommed up with the cranberries and pumpkin seeds. Boo. Luckily the combo was still tasty and fresh, even if it didn't arrive in the best shape. I'm sure this has nothing to do with Graze, though -- the sturdiest of chocolate pastilles would be doomed in this crazy South Florida heat. Oh, that grassy background in the pictures? It's printed on the inside of the cardboard box, so each time you lift one of the snacks out of its slot, a little patch of green is exposed. I love the attention to detail! Overall I was really happy with this box, and I'm going to continue my sub. These four little packages make perfect healthy mid-afternoon work snacks, since they're portioned and totally portable. And I can't wait to try out some of the dipper snacks -- the (healthy??) wholemeal banana shortbread dipping sticks and caramel sauce all but winked at me from the website! 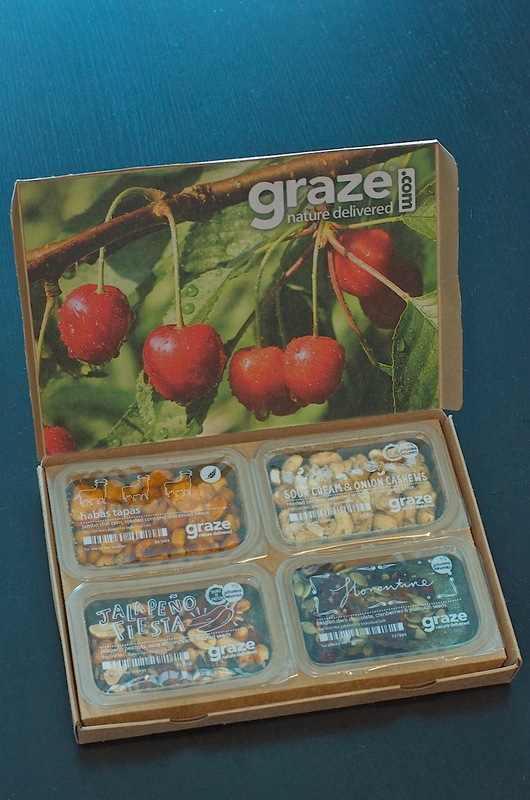 What did you think of the Graze box? If you're interested in finding out more or even subscribing, check out their website to browse their FAQs, snack gallery, and delivery options. 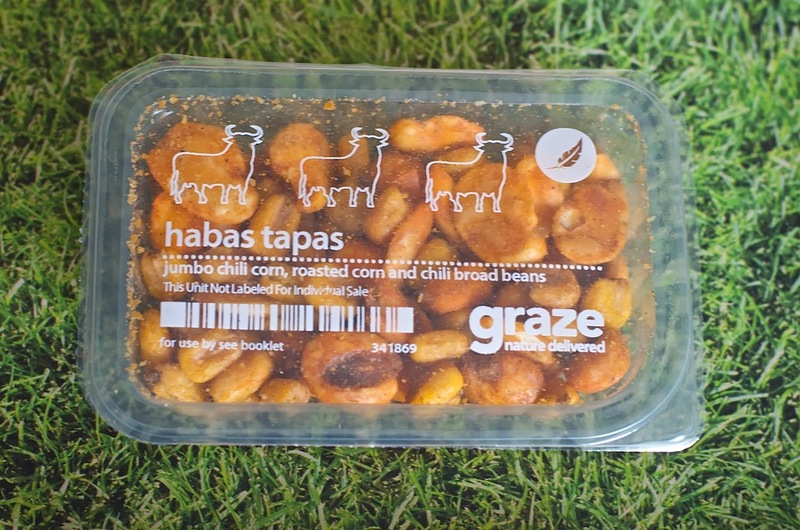 If you sign up using any of the links on this page, you'll get your first and your fifth boxes totally free, and I'll get a $1 credit to either apply towards my sub or to donate to the Graze School of Farming, an agricultural school based in Kabubbu, Uganda. You'll also get the same deal to offer your friends! Your second, third, and fourth boxes, and any after your fifth if you choose to keep your sub, are a mere $6 -- and that includes shipping and handling! These guys are a total deal. 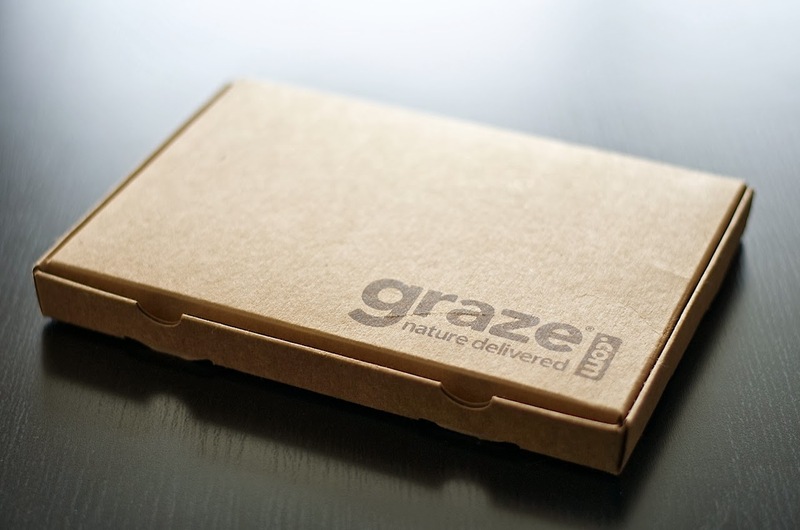 Are you already a Graze subscriber? What snacks would you recommend to a newbie?